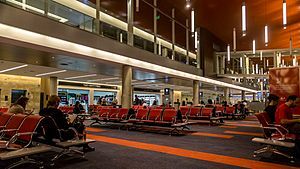 Ministro Pistarini International Airport or also called as Ezeiza International Airport is an airport located in nearby Ezeiza, Buenos Aires, Argentina. Its IATA code is EZE and ICAO code is SAEZ. Both North American carriers continue their flights to Montevideo, Uruguay. Ministro Pistarini International Airport Facts for Kids. Kiddle Encyclopedia.